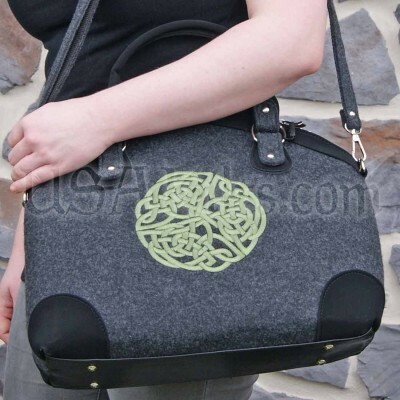 Handmade Celtic Knot tote -- real wool from Ireland! "The intricate loops of the Celtic infinity knot remind us of our connection to all of creation and to the endless journey." Practical yet elegant. The perfect bag for an over-night, a romp around the village, or any adventure! Crafted from natural grey boiled wool - the time-tested luggage material of the British Isles. The magnificent Celtic knot is embroidered in bright emerald green satin. Chrome steel double-zippers and hardware. Black faux suede trim and comfortable handles. Matching removable shoulder strap is extendable to 45". Reinforced floor for added durability as well as looks. Satin-lined interior features two small open pockets and one zip pocket. Quick-access zip pocket on back. Approx dimensions are 15" x 12" x 6". Hand made in County Kerry, Ireland by Mucros Weavers.